Jim Blake is President of A.J. Michaels and has been with the company for more than 30 years. Jim is a Master Plumber/Gas Fitter and holds certifications in NATE Air Conditioning Installation and Service and Heat Pump Installation and Service, BPI Building Analyst Professional and Envelope Professional, RRP Lead Renovator, MDE BAT Installation and Refrigerant Transition and Recovery. As President, Jim oversees A.J. Michaels with a goal toward providing the highest quality of work and solutions for customers while increasing profitability and sustaining a high level of company moral for the company. In addition to providing direction to all departments, Jim heads-up commercial sales, design, efficiency and performance upgrades. “I still really enjoy being in the field and getting my hands dirty. 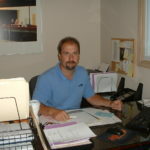 It’s not uncommon for me to run a commercial service call during our busy times.” Jim is proof that A.J. Michaels’ dedication to going the extra step for customers starts at the very top. Jim has seen a lot of changes in HVAC and plumbing during the past 30 years. “I enjoy the variety and challenge of adapting 21st century technology to what is sometimes 19th century buildings, but finding the talent to properly perform installations and servicing of equipment is becoming more and more difficult.” Jim points out that the increased use of advanced technology has separated the good techs from the bad by a considerable margin. Jim also looks at social media and the Internet and cautions that social media and the Internet can sometimes give too much information that can actually misguide customers into poor decisions. He takes pride in A.J. Michaels’ ability to educate and not just sell as evidenced by the Ask a Tech feature on AJMichaels.com. Of the thousands of satisfied projects and customers, Jim remembers one particular renovation that turned out very special. Quality installations like this have built A.J. Michaels’ reputation in the industry. An outdoorsman and gearhead, Jim enjoys home projects, time at the range and seat time on his KTM.